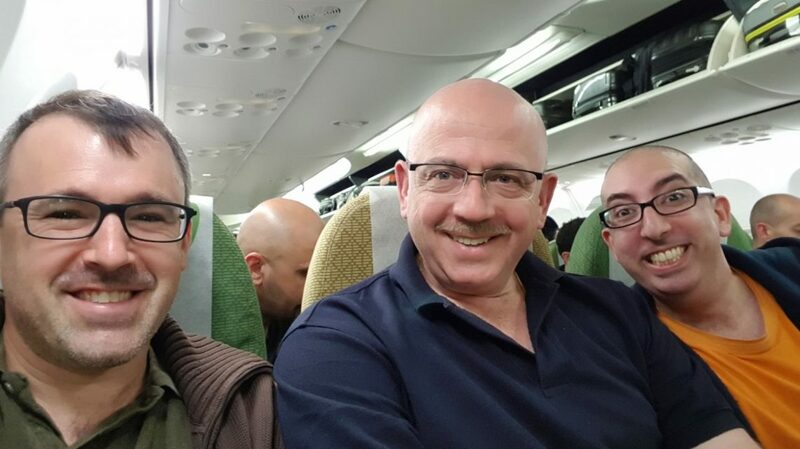 Photo: Dr. Josh Schroeder, Operation Manager Nurse Reuven Gelfond and Dr. Galel Yacobi. 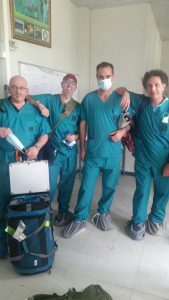 For the first time in history, scoliosis back surgery was successfully completed in Ethiopia, thanks to the Hadassah Medical Center surgical team that flew in from Jerusalem. Mebrat’s mom and dad don’t yet know that their daughter’s back surgery, performed by Hadassah Medical Center surgeons, was a success. They live in a farming town with no phone or electricity, far from the hospital in Mekelle. To convey the news, her brother-in-law, Girmay will phone someone who lives closer and he will make his way by taxi or donkey to their house. Mebrat has been living with Girmay and her oldest sister, Gidana, in Mekelle for two years, ever since her back started to hurt so much. The schools are better in Mekelle and Mebrat, whose name means light, likes to study. She’s 16 and a tenth grader. But in the last half a year, the curvature in her back went from a 45 to a 70-degree angle, with fears that she would be 90 degrees bent over. Mebrat hid the deformity in loose clothes. She didn’t have a boyfriend and she knew it was unlikely she would get married. Soon she would be at risk for life-threatening bouts of pneumonia because her back curvature would interfere with the functioning of her lungs. Not a surgeon in Ethiopia could fix it. In the past, children have been sent abroad to be operated on, but the Hadassah team knows how much better it is to enable a child to be treated in his or her supportive home environment. The good news for Mebrat was the arrival of the Hadassah spine surgery team in Mekelle. In four hours of surgery, using the equipment they had brought from Israel, layer by layer, they exposed the twisted spinal cord. Screw by screw, they chose the angle of repositioning the vertebrae. Working in tandem on two sides of the teenager, spine surgeons Prof. Leon Kaplan and Dr. Josh Schroeder – long-experienced at doing surgery together – p laced the screws. The anesthesiologists overcame challenges of an underperforming lung and an unsteady oxygen supply. 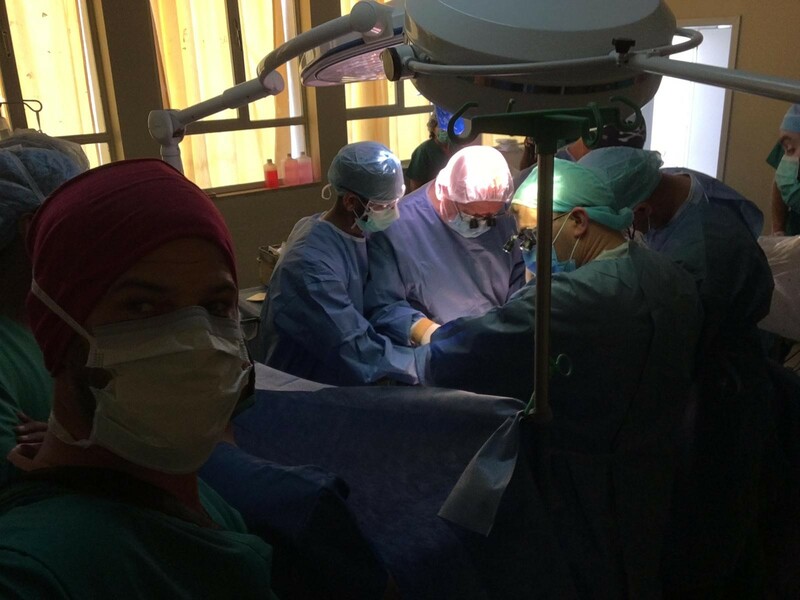 At last, Nurse Ammar Farhat handed Dr. Schroeder a titanium rod. Dr. Schroeder cut it to fit Mebrat’s size, and grimaced as he bent the metal so that the rod would cause her spine to rotate and straighten. Then the two surgeons worked quickly to attach hanging clips to hold the rod in place. Mebrat will begin physical therapy tomorrow and will be up walking soon. She’ll be straight and she’ll be at least two inches taller. All she can talk about is the surgeons whom G-d sent her way. 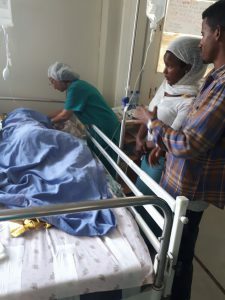 Hadassah’s surgical team had originally planned to do only Mebrat’s surgery on their first day of operating in Mekelle, but another emergency case came up. He was a 21-year-old man who, not wearing a seat belt, flew out of a car, severing his back. The surgeons fused it back together. The Hadassah Medical Center surgeons urged caution about celebrating this surgery until it was over. They were performing an extremely complicated spine repair on a 17-year-old who had a 110-degree back deformity. His twisted back was full of hills and valleys. The surgery would take many hours under anesthesia. From left to right: Dr. Gelfond, Dr. Jacobi, Dr. Sar-Shalom, Dr. Merozwith their patient’s rib cage. Five ribs were manually cut out to make space for the ribs to heal over the new back. The metal rods now need to work together with the boy’s bones to protect this young man. Watch the video documenting the journey.